Each year, on Columbus Day, Mark Lentz and I try to go mountain biking. 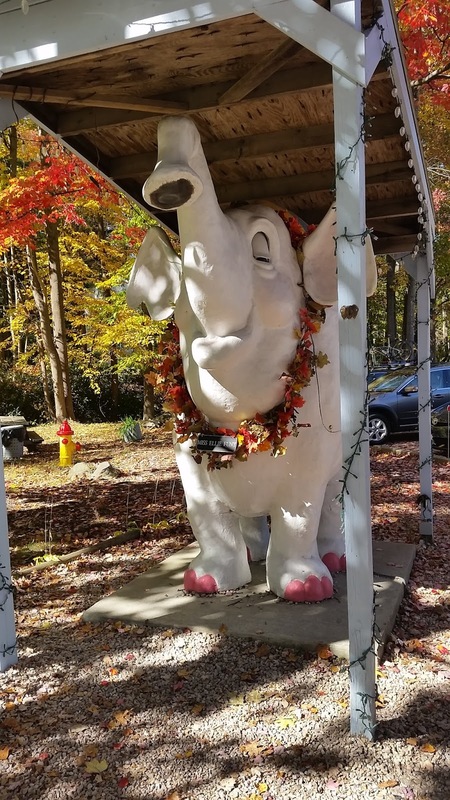 This year, in the spirit of the day, Mark and I decided to head to Caledonia State Park and explore the southern end of Michaux State Forest. Exploratory rides are so fun...but one of two things can happen. 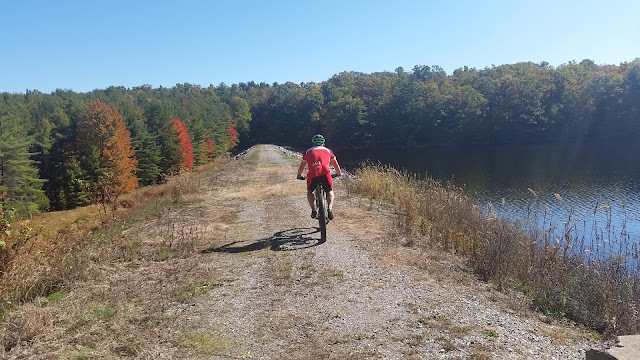 Number one: You can ride all day and keep back tracking out of trails because you find out that you have wondered onto land that you are NOT suppose to be on. Or...Number two: you have what happened today. 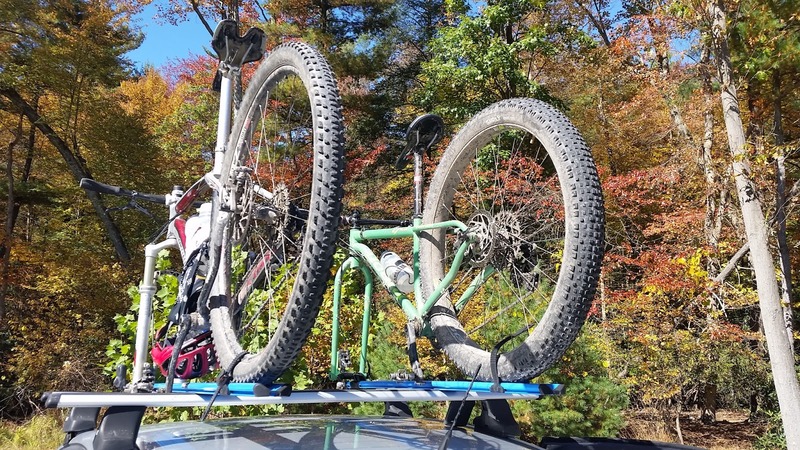 We found fantastic fire road, miles of old logging roads, fun single track, fast downhills, and...one or two hike-a-bikes. 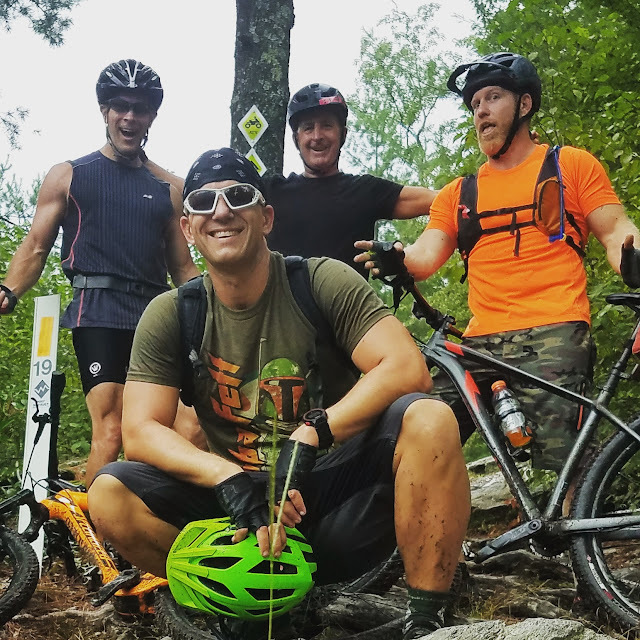 Yeah...today was 26 miles of mountain biking fun! No plan. No maps. We did have our cell phones...but they are only for emergency purposes. Time to explore. Heading across Route 30 we began turning pedals up Rt. 233 looking carefully for trails or access roads off to either our left or our right. About a quarter of the mile up the road Mark noticed a trail marked with blue blazes. Jackpot! Up and off we go. On a morning like this, when the temperature is cool and crisp, beginning on an uphill climb is a welcome thing. It gets the legs spinning, the heart pumping, and the blood flowing. Before long, we completely forgot the 40 degree morning temperature. To our delight the local foliage seems to be almost at 100%. The colors around us...the reds, the oranges, the yellows, were so vibrant. Our path seemed picture perfect. 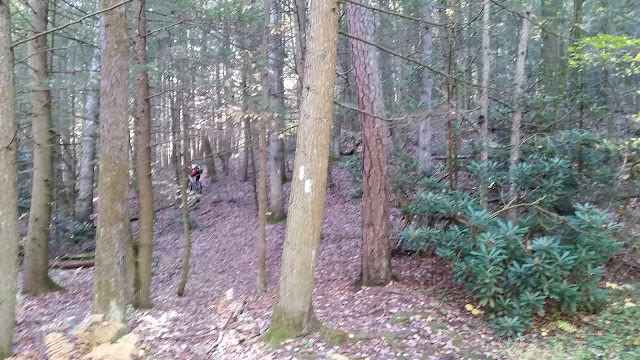 Headed up South Mountain, our trails turned into old logging roads. By the looks of things nobody had been on these roads for ten or fifteen years. One of the roads began to wind up and up and up some more. By this point, all I know is that I'm somewhere near Caledonia, in Michaux State Forest, on South Mountain, south of Route 30...and it doesn't matter. We have all day. This is what exploratory rides are all about. Exploring, finding new trails, not knowing what is around the next turn, and just enjoying the moment. This particular trail ended up looping back down to the logging road we started on. On we go until, a little up the trail, we found our first NO TRESPASSING sign. People who live way up here have those signs up for a reason and I'm sure they don't want to see me on my bike passing through. This was the only place, all day, that we turned back to find another path. It actually tuned out to be a great thing. Coming down the logging road we found Carbaugh Reservoir. How beautiful! 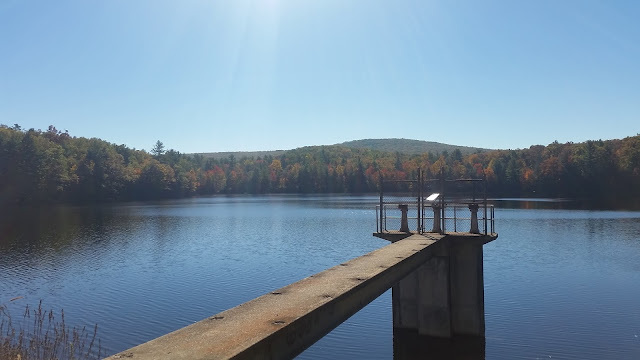 Mark and I took a moment to soak it all in...then continued across the dam to the other side of the lake. The trail on the other side took us either up and away from the lake or down towards it. I didn't even have to ask which way Mark wanted to go. Up we went. The trail above the lake turned into a flooded out muddy mess. There was no way avoiding this....but that is part of not knowing what is up ahead. Mark and I have ridden things much worse, so, all things considered, it wasn't all that bad. It just confirmed for me that me, my bike, and my shoes would need a shower when I got home! 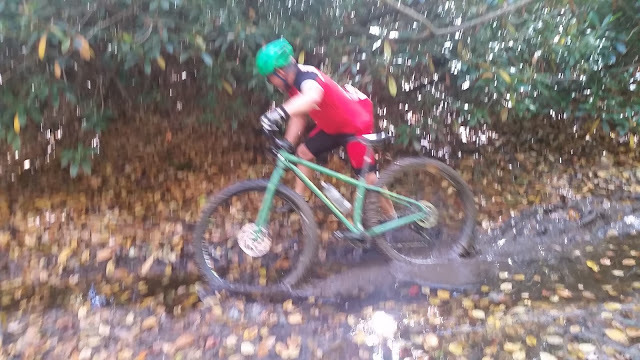 Coming out of the mud we found a single track that was an absolute treat. 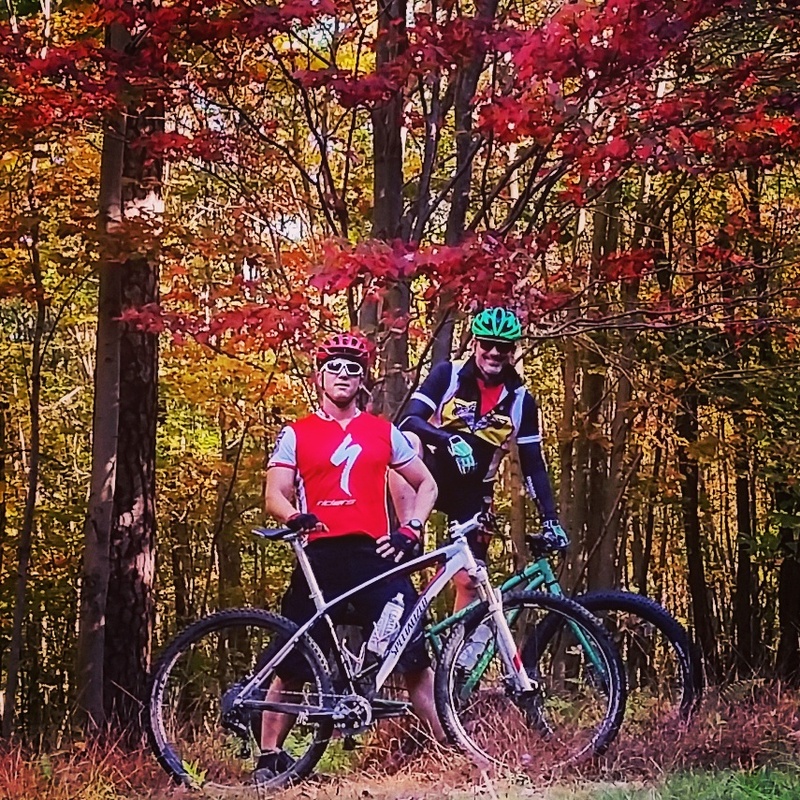 You know it's a great trail when the conversation stops and we just ride...enjoying every moment. Halfway through it we came across a cut line in the mountain where the gas lines are buried. 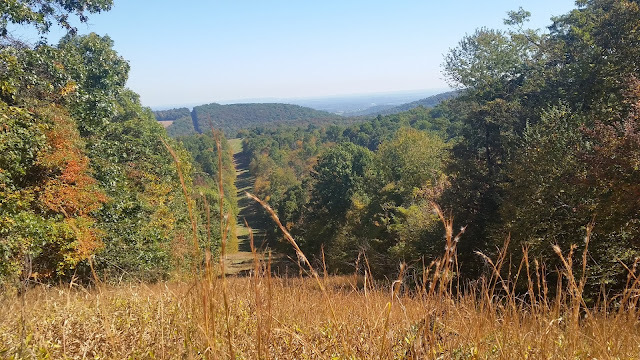 An amazing view of southern Pennsylvania (and possibly northern Maryland) opened up to us. This is what today is all about! By this time we realized that we needed to think about getting back. 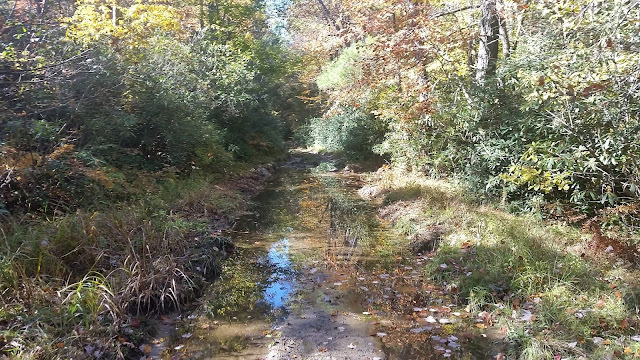 Our trail ended up dumping us off on Cold Spring Road approximately eight miles from Caledonia State Park. Amazing. In my head I envisioned where we would come out...but I had no idea that we had meandered this far from where we started. Cold Spring eventually intersected with Route 233. We ended our ride today with a four mile down hill blast straight back to Caledonia State Park. Crossing Route 30, and entering the state park, you can't miss the old iron furnace that is visible from the main road. 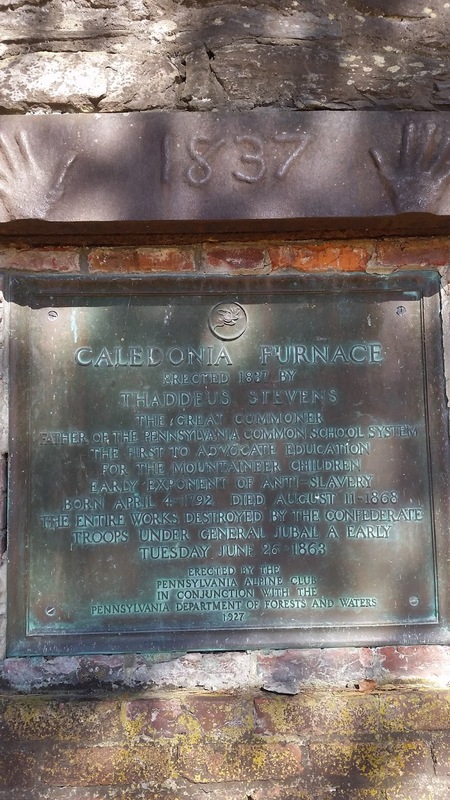 The furnace was owned and operated in the 19th century by Thaddeus Stevens. 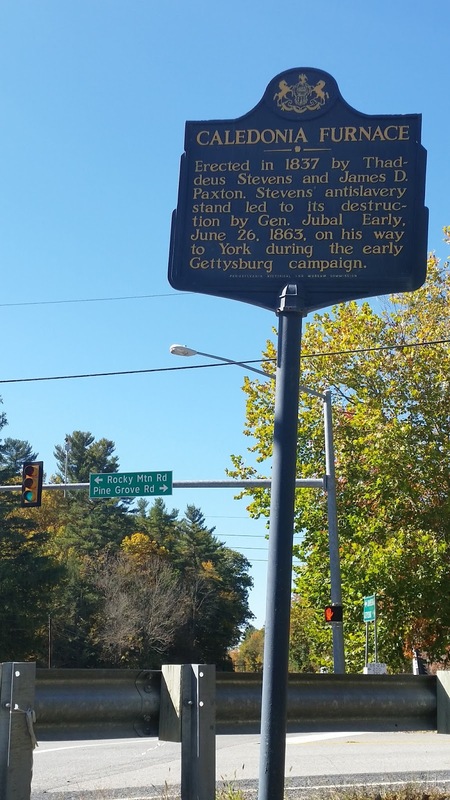 Stevens was a member of the United States House of Representatives and served in congress during the American Civil War and Abraham Lincoln's presidency. 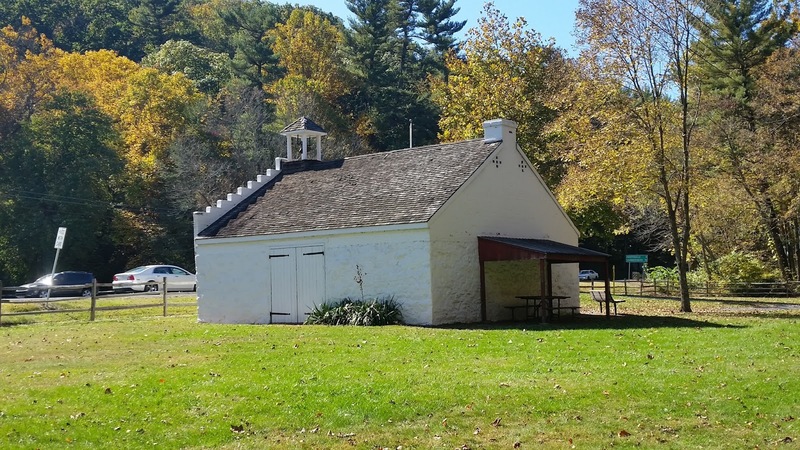 The furnace was destroyed by Jubal Early's Confederate division as it marched through the area in 1863 prior to the Battle of Gettysburg. 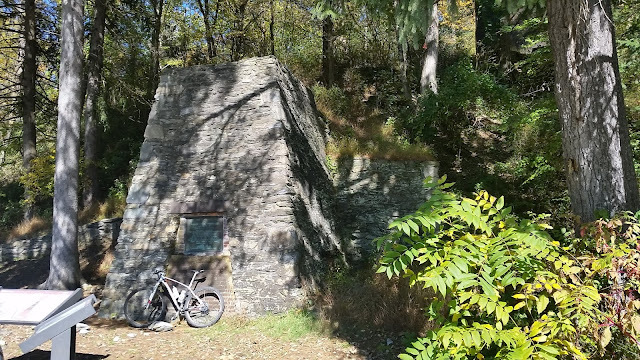 The furnace stack that stands today, as well as the blacksmith shop a few yards away, are reconstructions that were built in the 1920s by the Pennsylvania Alpine Club. Now for the ice cream! Not so fast. Today Mark and I decided to check out Mr. Ed's Elephant Museum & Candy Emporium. 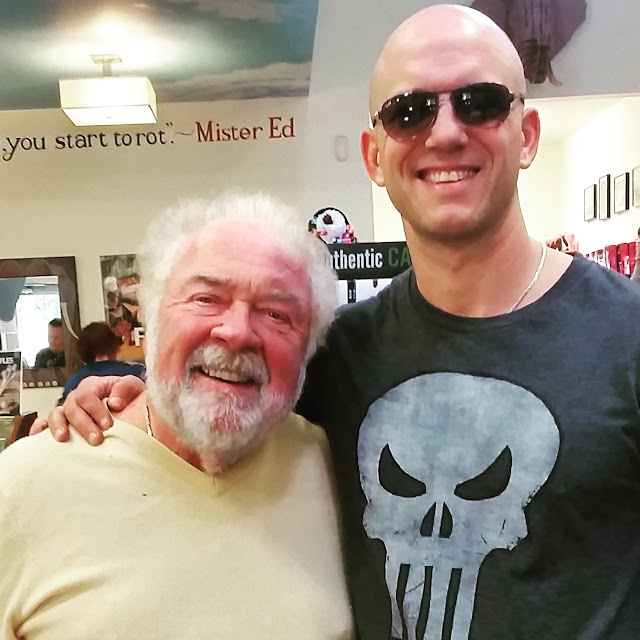 Just up the road from Caledonia, Mr. Ed's is an oasis of fun! 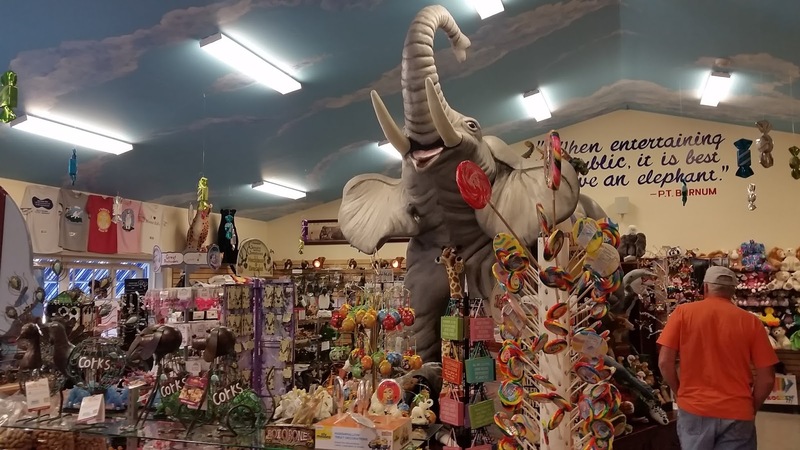 With over 12,000 elephant figurines, whimsical gardens, circus souvenirs, and AMAZING homemade fudge, Mr. Ed has something for everyone! Today I went straight for the fudge. 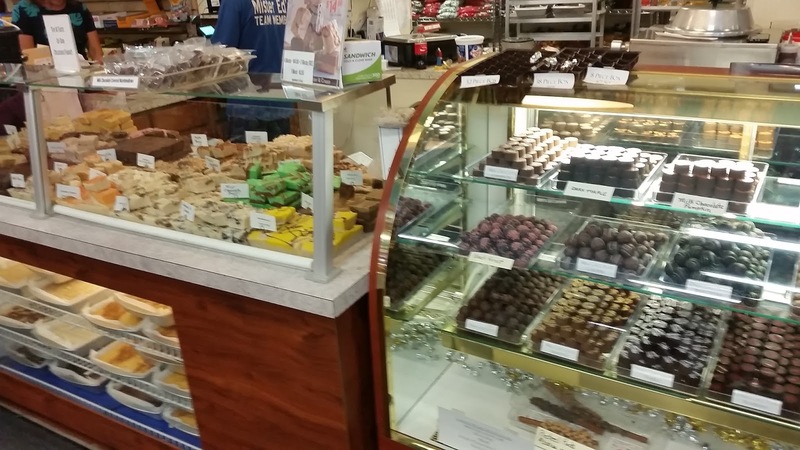 I figured, that after a 26 mile mountain bike ride, I could treat myself to a chunk of chocolate and peanut butter fudge. My favorite! I devoured it in two minutes! 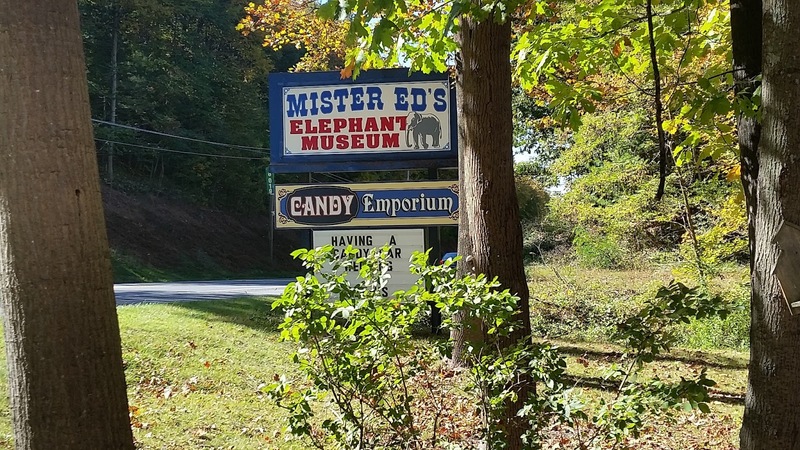 Mr. Ed's Elephant Museum & Candy Emporium located east of Caledonia on Route 30 -- October 12, 2015. 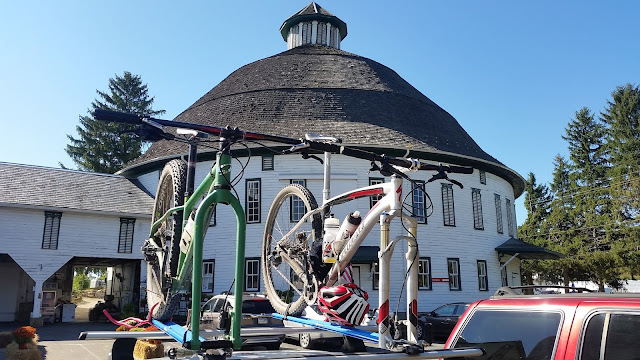 If Mr. Ed's wasn't enough...on the way home, Mark and I passed the historic Round Barn. It's one of only a few true round barns still in existence. 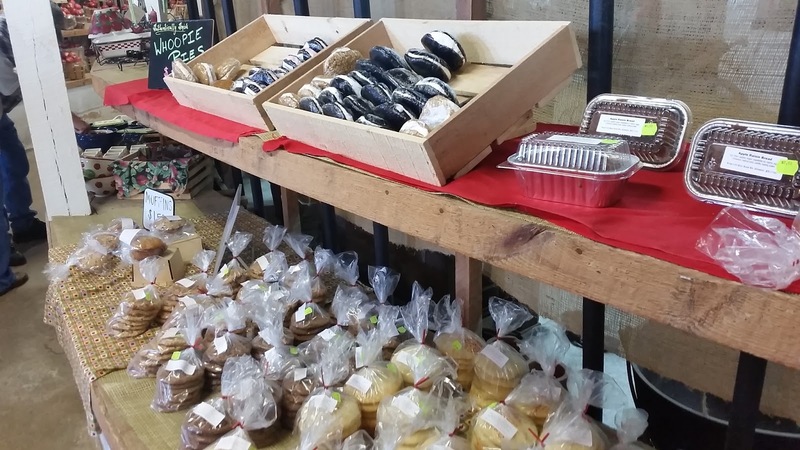 Along with fresh fruits and vegetables, you can also get homemade jam, jelly, and baked goods. My stomach lead me right to the sugar cookies and whoopie pies. It's a weakness of mine. 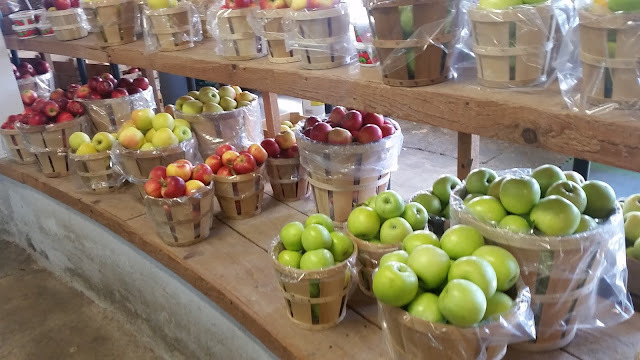 Plenty of fresh fruits to be found at the Round Barn. Columbus Day didn't disappoint this year. 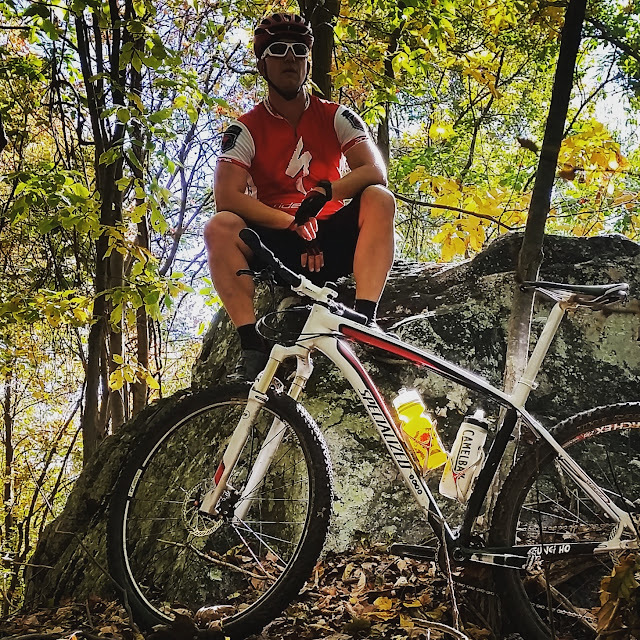 A perfect day of exploration...new trails, new sights, amazing treats, and a great appreciation for the beauty and history around us.